A few years ago I attended a small evangelical church. Once, after I had missed too many Sundays in a row, a friend expressed her concern to me through a message: “How are you feeding your spirit if you are not regularly attending church?” she enquired. This is my response to her all these years later. If you were to look, you would find me spending time with the Wild Things. The Wild Things live in a place far removed from any church I have attended. They inhabit a headspace fertile and lush with a variety of ideas, philosophies, and theories – both new and ancient. They have welcomed me like I was always a part of them. This is where my spirit receives nourishment. The Wild Things are not afraid of raw emotions – theirs or mine. Like the Psalmists before them (those great Wild Things of the past) they freely express themselves. Whether joy or sorrow, contentment or unrest, the Wild Things embrace it all for they know the only way to navigate the waves of feelings is to hit them straight on and ride them through to the end. I am safe here with the Wild Things. They acknowledge every one of us as acceptable in all of our conditions. Their strong faith far exceeds any need for pretenses or for sweeping issues under the rug. It is with the Wild Things that my Spirit has healed. Here with the Wild Things, I am free to ask hard questions. We all are. They don’t mind inquiries that are challenging and that make us all a bit uncomfortable or at a loss for quick, presupposed answers. 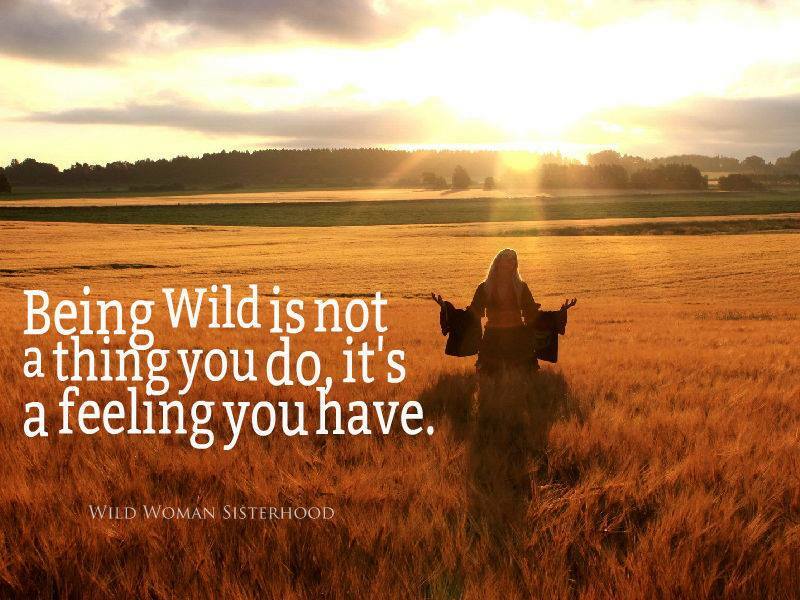 Wild Things accept that healthy relationships are based on equality and that we learn and grow by confronting the challenges that arise through honest and reflective interactions with each other. We are comfortable in our discomfort. It is with the Wild Things that my Spirit has awakened to it’s value. The Wild Things are not afraid to explore new traditions, theories and customs from different regions. They ascribe to the adage “Not all who wander are lost” (J.R.R. Tolkien). How they love to listen and learn from others. They know that, though there may be superficial differences, the same One Beautiful Creator breathed life into all beings. They know this Creator to be a Wild Thing too. Wild Things gain much knowledge in their open-minded explorations. It is with the Wild Things that my Spirit has grown strong and matured. If you are curious, the Wild Things can be found in all walks of life. Some are as old as the Bible, in the form of Mary who broke the rules and sat at Jesus’ feet instead of helping her sister make dinner. Some are found in libraries and dusty book shelves, with names like Thomas Merton and Brennan Manning. Others, having less famous names but being just as wild, can be found when hearts are open during daily life – at work, while commuting, in neighborhoods and stores. The Wild Things are everywhere. This entry was posted in Uncategorized and tagged Christianity, Emergent Church, Luke 10:38-40, Post-Evangelical, Spirituality by flexiblyblessed. Bookmark the permalink. Those are all good things but the fellowship of believers and being mindful to remember the scripture that tells us not to forsake the gathering of ourselves together is essential to a true believers walk with God as well. Lone Christians often develop into an oddity that is not what Christ had in mind when he established the church; his body. We are all to fit together and work together. I have a tendency to isolate from other believers too. It’s hard work creating relationships and intimacy with others in Christ but you find out more about yourself this way than all the other ways you mentioned out together. Good writing though. I get it. Perhaps the problem is that in recent years, Christians have this attitude of ‘subscribe to our church creed or go find another church’ they don’t always accept other points of views or study anything beyond what the little Bible study booklets allow. Christian fellowship is a fine thing, but I think they would do well to be more accepting. I think what you’ll find is that those of us with the Wild Things wanted more depth from our churches, but were starved of insight, discussion, debate, theology, history, etc. and stuck in the shallow services that never filled us up. So we had no choice but to wander off on our own to keep from being lost in our own churches. Nice. I like this, and can relate. In a perfect world we could go to church and “fellowship” with other believers. But, sometimes it is too emotionaly draining to put on your church face and play the role that everyone expects you to play. Personally, I had to remove myself from toxic relationships. I felt like a square peg that people wanted to shove into a tidy round hole. For someone who’s a Wild Thing the stress of conforming overshadows communion with God and other believers. I love your analogy!